Where’d that Meat Come From? A few months ago, I wrote a blog piece about being a meat eating Yogi and how I can’t survive on veggies alone. What I didn’t say was how important it is to know the source of your food. We actually are what we eat, and we are also what the animal we are eating has eaten. If the chickens and cows we’re eating are filled with hormones and corn, and raised in places that cause them anxiety and fear, we are ingesting those chemicals, corn and fear. Not to mention any other issues. What we eat has a huge impact on our health and how we feel. One of the best ways to insure we are eating happily raised animals who have lived healthy lives is to know your food source and where and how the animals were treated. 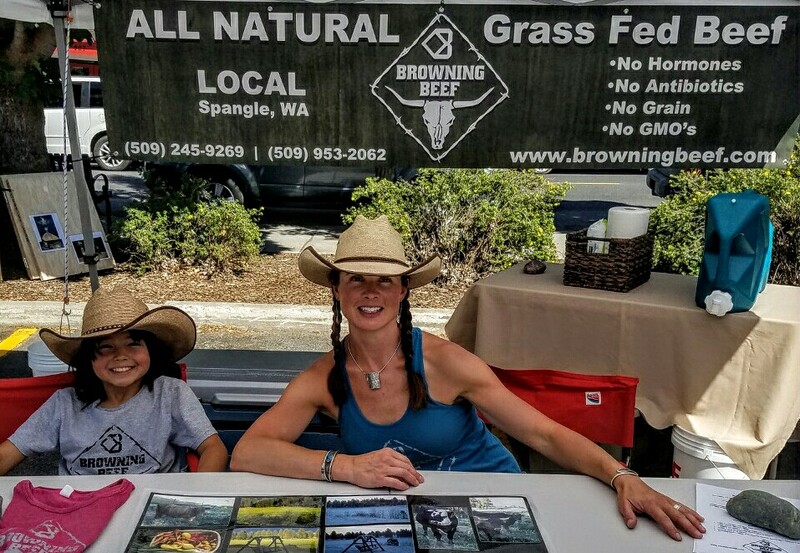 In this blog piece I want to introduce you to friends of mine, who are yogis and who raise cattle in the Inland Northwest: Frankie and Bill Browning, who run a family ranch in Spangle, WA. Their cows live their entire lives happily grazing pastures, and are hormone and anti-biotic free. Why did you get into the cattle raising business? Bill was already in the cattle raising business when I met him. He always wanted to do it. He grew up on horses and roped, so it was in his blood. We started out as sport and hobby – roping cows. I was the one who was more into the food idea. Before I met Bill, I was a borderline vegetarian. I certainly didn’t eat beef. But, I also had this affinity towards Native Americans and their stewardship of the land, and how they offered prayers and blessings when they sacrificed an animal for food. What lead you to raising cattle that graze in pastures? We had an incident that changed everything for us in how we raised our cows. One of our cows had a traumatizing birth situation. The mother and calf should not have lived, but we intervened and ended up saving both mother and calf. It was truly a miracle. The mother cow could never give birth again, and we just couldn’t send her to the feed lot to have a horrible life and die. So, we gave her a new life in our pastures and later, we sacrificed her life with much gratitude and she fed us. We kept her skull, and her hide (which is still in our house) and gratefully nourished our bodies with her meat. That was the turning point for us. We then decided to raise cattle to sell for beef, and to raise them with love and give them a good life before becoming our food source. As we started keeping more meat for ourselves and selling it to friends, people began to notice how good the meat tasted and we began to pay attention to how the animals lived and how the land was managed and impacted the cow’s lives. How did your business grow over the years? When I met Bill, he had 20 cows. That was 13 years ago. We now have 150 cows. The growth of Browning Beef has been an organic process. The cows are all raised from birth on our property. They are all grass fed and grass finished. We don’t give them any grain, no GMOs or hormones. All of our hay is bought locally. Why is your grass-fed beef not tough? Well, it’s super fresh. It hasn’t traveled or waited anywhere. It could also be the Longhorn influence we have in our breeding. The lean flavor of the meat resembles bison. Why did you start eating meat again? I started eating meat again because I knew where the meat came from and how we raised the cattle. And it’s so delicious. How does being a yogi influence your business? Yoga continually reminds me of the connectedness we have with all living beings. Having a first-hand connection to my food, and being able to share this with others is a gift. What are your biggest challenges raising cattle? The nature of raising cattle is that you don’t get to go anywhere. It is a business that grounds you. We’re also dealing with the seasons and their mercurial nature all of the time. There’s also the temptation to make your calves weigh more and use grain. But that’s not what’s best for the animal or the environment, and it doesn’t support our values. From a fiscal perspective, I’d say it’s challenging to get people to understand why it’s worth spending more for grass fed beef that has never touched grain, corn or bread, been in a feed lot or pumped full of hormones. We take a cut in that the hanging weight because the weight of a grain fed animal can be between 800-1000 pounds where our grass-fed cattle are 400-600 pounds. Sometimes, doing the right thing requires sacrifice. What do you see as a major benefit of raising cattle this way? There is a symbiotic relationship with cattle and the pastures they graze – the pastures literally come alive and are happy with grazing cattle. They look like green parks. Noxious weeds are naturally controlled with mindful grazing practices. The food we are producing is super clean, and is a healthy source of beef for our community. We know that people feel great when eating our beef. The major benefit is that everybody prospers. The land flourishes, the cattle are happy, people who eat the beef are healthy. It’s a win/win all the way around. Being so reliant on the Earth for our lively-hood keeps us highly attuned with Mother Nature. We graciously do our part, staying in harmony with the environment by creating multiple ecosystems on our ranch. Despite "loss" of grazing land from our ecosystems, doing the right thing to help the Earth and future generations is both and honor and a duty. Where can we buy Browning Beef?